Los Angeles, Nov. 27, 2017 – Ford, America’s truck leader for 40 straight years, has bested all competitors to earn 2018 Motor Trend Truck of the Year honors for the new Ford F-150. This is the fifth win for F-150, and this award follows the all-new Ford Super Duty capturing the award in 2017. The Ford F-150 line went up against the latest competitive truck offerings in a program that combined empirical and real-world testing to find the truck that best met the award’s key criteria: advancement in design, engineering excellence, safety, value, efficiency and performance of intended function. Motor Trend editors put to the test four vehicles from the Ford pickup lineup: the 2018 F-150 XL with the all-new 3.3-liter V6 engine, F-150 Lariat with the all-new 2.7-liter EcoBoost®, F-150 Platinum with an enhanced 5.0-liter V8, and the high-performance off-road F-150 Raptor. Judges cited overall towing capability, advanced technology functionality and powertrain performance among their favorite F-150 attributes. They also noted exemplary on- and off-road driving performance, best-in-class fuel economy and innovative cab design as F-150 strengths. 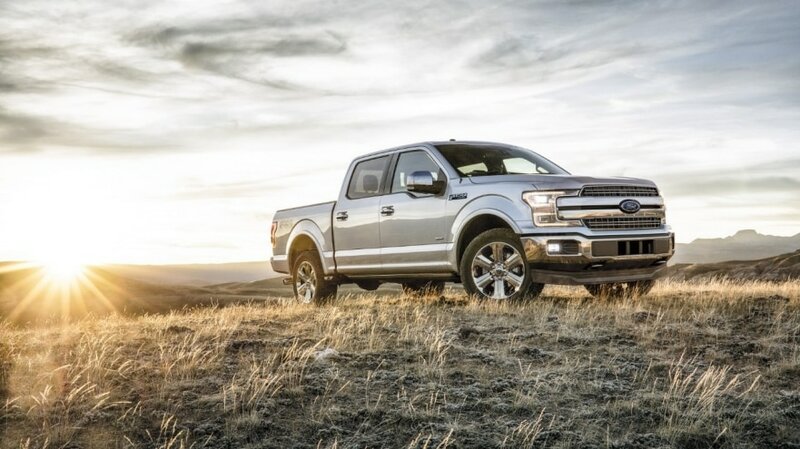 The 2018 F-150 features a number of design updates and technology enhancements across its powertrain, driver-assist and connectivity offerings, making it tougher, smarter and more capable than ever. Major exterior freshening across the lineup includes new grilles, bumpers, headlights, tail lamps, tailgate outers, wheels and more. Interior updates on XLT Sport, XLT Special Edition, Lariat, King Ranch, Platinum and Limited trucks include color and material changes for seats, instrument panel and console trim. An all-new B&O PLAY™ audio system by HARMAN is also available. With an EPA-estimated rating of 20 mpg city, 26 mpg highway and 22 mpg combined, the second-generation 2.7-liter EcoBoost-equipped F-150 delivers best-in-class fuel economy. Powered by the 3.5-liter EcoBoost, F-150 offers best-in-class towing capacity of 13,200 pounds. Design elements such as rear-hinged doors on the SuperCab truck that ease access to the rear passenger compartment, an available twin-panel power moonroof, and new technology features like Apple CarPlay and SYNC 3 got high marks from Motor Trend editors. Praise for the F-150 XL with all-new 3.3-liter V6 engine touched on how easily the truck can tow trailers weighing 7,700 pounds – the maximum rating for the base engine. Motor Trend editors were as impressed with the power and handling of the all-new 2.7-liter EcoBoost V6 in F-150 Lariat as they were with the truck’s ride and level of luxury appointments. The chassis smooths out large road undulations with ease, and steering is “shockingly precise,” they reported. Judges also tested the F-150 Platinum with 5.0-liter V8 that features significant upgrades, including advanced dual port and direct-injection technology and spray-on bore liner technology for reduced weight and best-in-class payload capacity of 3,270 pounds. The enhanced engine is paired to a segment-first 10-speed Ford SelectShift™ automatic transmission with four selectable drive modes – normal, tow/haul, snow/wet and sport. The new 10-speed automatic is shared with the 2.7-liter and 3.5-liter EcoBoost engines as well. One Motor Trend editor said the 5.0-liter V8 is a sweetheart of an engine, with tons of power. With 450 horsepower and 510 lb.-ft. of torque, F-150 Raptor impressed judges with the quick and responsive kick from its twin-turbocharged, high-output 3.5-liter EcoBoost engine, enhanced by its segment-exclusive Ford SelectShift 10-speed automatic and industry-leading six-mode Terrain Management System™. Raptor’s high-strength, military-grade, aluminum-alloy body saves 500 pounds over the previous model, which pays off in a stronger, more agile truck. F-150 Raptor’s competition-proven chassis sets the performance bar with its second-generation BFGoodrich KO2 tires designed exclusively for the truck’s extended off-road capabilities. In addition, FOX shocks, jointly engineered by Ford Performance and FOX, feature three-inch-diameter shock canisters and nine-stage bypass damping to optimize suspension control and provide massive suspension travel that includes 13 inches at the front and 13.9 inches at the rear. Built at Dearborn Truck Plant in Michigan and Kansas City Assembly Plant in Missouri, the 2018 F-150 is available now at Ford dealerships nationwide.